Welcome to the lands of Glengorm and Rossal, where Sorcha and her shapeshifting children dwell. The tales below are listed in their chronological order for your convenience. An unimaginable love between a human sorceress and a dragon lord has created a new race of beings. Neither wholly dragon nor fully human, Sorcha’s children shapeshift at will. 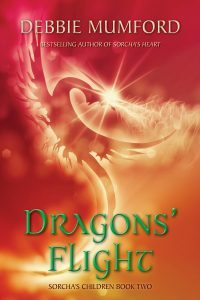 The six fledglings have been raised as dragons, but the time has come to explore their human heritage. Aislinn and Taran are the first to leave the ice aerie for the world of men. In this second volume of the Sorcha’s Children series, shifter siblings Brandubh and Morag take flight. Brandubh travels to King Leofric’s court to discover if his destiny lies in the human realm, but his visit is marred by the news that dragons have destroyed a human village. King Leofric charges the dragon-shifter with seeking out and subduing the renegades, but the stakes increase when Brandubh meets a fascinating female dragon … who considers humans vermin to be exterminated. Meanwhile, Morag shows no interest in life among the humans, preferring to live life on the wing. But can she convince the male dragon of her choice that she is the bond mate he has been waiting for? Only time will tell if these dragons will succeed in mating flights.